I’m going to be defending my thesis. 8 AM. If you’re in the area, you’re more than welcome to come! The more the merrier. There might even be a delicious snack. No promises, but it’s a good possibility. Here’s the official announcement. Because I’m WordPress illiterate, I couldn’t manage to figure out how to embed a PDF in this post. Apparently I need to install a Plugin, but I can’t find that in my administrative dashboard, and I was driving myself crazy trying to figure it out. And trying to have a beautiful high-resolution image to share with the blogosphere is probably one of the least of my worries at the moment. So you’ll have to settle for this smaller jpeg image, and click on the link below if you want to see the beautiful PDF. That’s all for now- wish me luck! 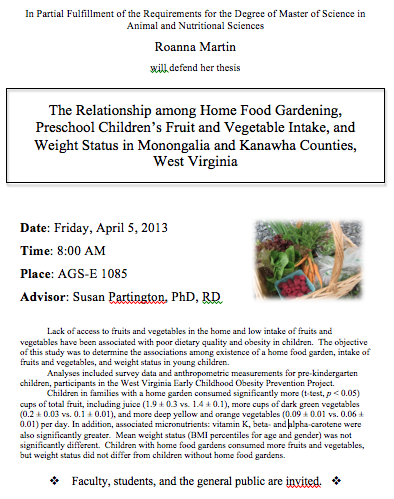 Categories: Community Nutrition, Professional Development | Tags: fruits and veggies, home gardening, masters thesis | Permalink. What does that mean for you? Is it grabbing some food and eating in front of a TV, is it picking up take-out on the way home from Junior’s late basketball practice, or is it dinner around the table with your family- perhaps chicken with mac & cheese and broccoli and a glass of milk? Increased frequency of family meals has been associated with increased intake of fruits, vegetables, grains, and calcium-rich foods, and decreased soft drink consumption (1). In addition, having more meals together as a family may reduce chance for disordered eating behaviors (2), and curtail other high-risk behaviors among adolescents (3). The kitchen table is a wonderful place to build relationships, nourish the body, and rewind after a long day. As part of my graduate program, I am working with a West Virginia early childhood obesity prevention project called Choose to Change. A few weeks ago, we hosted a “Family Fun Night”, where families simply came to a community center for a free meal, and engaged separate activities for kids and adults, promoting the importance of family meal time. The tables were set and waiting for families to arrive. The benefits of family meal time aren’t about a beautiful table setting or fancy courses. It’s simply having people together, talking and sharing life with one another. However, we did put a bit of extra effort into creating some masterpiece centerpieces- turkeys crafted out of melons, grape skewers, and pepper slices. After the meal, I hung out with the little preschoolers. We had fun activities like a relay race to set the table, and bean bag games where some colors were “healthy foods” and others were just “sometimes” foods. Choosy, the mascot for the program, showed up. This was a huge hit with the kids. I managed to get a picture with him too! Family meals were always a priority in my home growing up, and I’m incredibly thankful that my parents chose to make these evening rendezvous an essential part of our day. I learned a lot around the kitchen table. As a college student, family-style meals can’t always happen, so I’m even more thankful when they do occur. These past 6 weeks I have been completing a clinical rotation about 2 1/2 hours from where my apartment is. I’ve been blessed by living with a great couple here, who have graciously opened their home to Emily and I. Here we are, enjoying a family-style meal together. A bit of Thanksgiving dinner and sparkling cider at the dining room table- this didn’t happen every night, but we did enjoy eating dinners together when able. It’s hard to believe that this clinical rotation has come to a close already. Good-bye, Charleston! Categories: Community Nutrition, Professional Development, Wellness | Tags: family meals, food, health, registered dietitian, West Virginia | Permalink. A brief article published on Eatright.org- the website of the Academy of Nutrition and Dietetics, the world’s largest organization of food and nutrition professionals- caught my eye recently. Entitled “Four Ways to Shed the Weight for Good”, the article puts forth a few strategies employed by people who lost 10% of their body weight and successfully kept it off, as compared to those who lost similar amounts and regained the weight. Weigh yourself regularly: it’s best to weigh in at the same time of day and on the same scales to monitor progress. Keep it going: continue to employ the habits that helped you to lose weight. Keep food and activity logs, and continue to practice portion control. Plan ahead: Use problem-solving skills to prepare for upcoming potentially difficult situations, as well as catch yourself mid-stride. Engage in positive self-talk: using positive reinforcement mentally, verbally, or even journaling can be a great place to do this. Speaking of journaling, I’m a huge fan. I haven’t implemented this practice as much for weight loss/maintenance in my life as much as I have used it for mental and spiritual health. The blank white pages present a clean white slate to scribble, scratch, design, paste, sketch, and scrawl. I began journaling when I was about 6 years old, and I’ve filled nearly 26 journals since then. Journaling and introspection are a big part of who I am, and as I am in the midst of taking steps towards becoming an RD, I find it important to have habits in my life that are grounding and provide balance. My journal is a place where I can process emotions and have a creative outlet, without fear of judgment or rules. But back to the practice of journaling for weight loss and maintenance, I found a great list of journal prompts. When modified to exclude the term “diet” in it’s mainstream definition as “a restrictive food pattern” because I think that overall food habits should be the most emphasized, these are some great questions. Categories: Professional Development, Wellness | Tags: diet, overweight, registered dietitian | Permalink.